The new report by the Zion Market Research on the “Global Uncoated Paint Protection Film Market — Global Industry Analysis, Size, Share, Growth, Trends, and Forecast, 2016 – 2024" has vast information about the market and its potential. 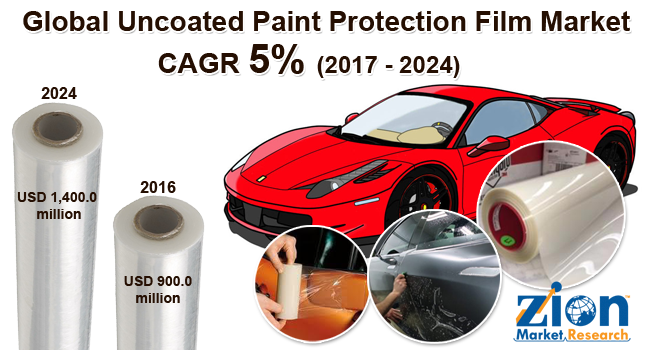 The global uncoated paint protection film (UPPF) market was valued at more than USD 900.0 million in the year 2016 and it is expected to reach more than USD 1,400.0 million by 2024. The global uncoated paint protection film market is expected to exhibit a CAGR of more than 5% between 2017 and 2024. In terms of volume, the demand for UPPF is expected to reach more than 90 million square feet in 2024 at a CAGR of more than 4.5% during the forecast period. The major factors that will boost the growth of the Uncoated Paint Protection Film market are an expansion of automotive industry across the globe and rising demand for UV-curable paint protection film. The automotive sector is the largest application of UPPF and the rising number of automobiles across the globe, especially in the developing regions, would further boost the demand for UPPF from this industry. Our research analysts during primary and secondary research observed that increasing adoption of electric vehicles (EVs) and the introduction of innovative UPPF with multiple features would provide ample opportunities for growth of Global Uncoated Paint Protection Film market. The global Uncoated Paint Protection Filmmarketis segmented on the basis of the product type, application, and the geographical regions. Transparent Paint Protection Film holds major share in product type segment. This type of UPPF is clear and transparent. It does not change the color or alter the look of the painted surface. It maintains the original shade of the painted surface. Transparent Paint Protection Film is in high demand across the globe. However, yellowing and stains appearing on the film due to exposure to sun and other factors could hamper the demand for Transparent Paint Protection Film during the forecast period. Premium Self-Healing Film is expected to grow at the fastest rate during the forecast period owing to various advantages such as prevention of dents, folds, and original appearance of the UPPF. In 2016, Premium Self-Healing Film generated revenues more than USD 300 Million. In the application segment, the automotive industry is dominating the Uncoated Paint Protection Film market. In 2016, automotive industry consumed more than 40 million square feet across the globe. UPPF are widely utilized in automotive industry to protect the paint from corrosion, scratches, dents, rust, and other external factors. Increasing number of cars coupled with increasing trend of EVs is expected to boost the demand for UPPF in the automotive industry during the forecast period. The market is developing at a rapid rate in the developing regions. The major market share for the Uncoated Paint Protection Film market was contributed by the Asia Pacific.The Asia Pacific dominates the market which is followed by North America. There is a rising awareness in the Asia Pacific regarding the benefits of UPPF in various industries such as automotive, electronics& electrical, and aerospace & defense industry among others. Increasing industrialization, automotive manufacturing, electronics manufacturing, semiconductor manufacturing, coupled with defense and aerospace activities are expected to boost the demand for UPPF in the region. China, Japan, India, ASEAN, and South Korea are some of the leading countries in the Asia Pacific to adopt UPPF. The major market players in the Global Uncoated Paint Protection Filmmarket are 3M Company, Argotec, Avery Denison, Eastman, Hexis SA, Orafol, PremiumShield, and XPEL among others.